I specialize in hand carved/hand painted wood miniature animals 1:12 scale and smaller. Fully detailed with carved eyes, toes, paw pads, birds fully feathered. 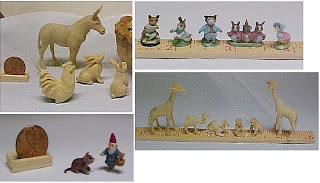 Each is carved entirely from one little block of wood, meaning nothing is glued on later. I carve "your pet" from your photos, for the personalization of pet cremation urns, or for the dollhouse. Have your pet residing in your dollhouse! I also make functioning dollhouse miniature accessories. Hand made, many different mediums used. I make very realistic drawings and paintings that look like a photograph, full size or miniature. I named my little business after my beloved Miracle Chicken. I hatched her, she was my child. You can read a short story, The Story of Miracle Chicken at http://www.miraclechickenurns.com/. My first memory as a baby was loving tiny things. I began collecting miniatures, then as a teen, I was thrilled to discover I could make minis. A friend gave me my first carving set, x-acto knives. I still use them to this day. I began carving animals from people's photos, and then when my rabbit died, I made him an urn and the business was born.